Just a three-minute walk north of Lansdowne station is a vacant TTC storage facility slated for major redevelopment across from a series of established, single-family homes. Among them is this detached house with a garage that mounted enough interest to generate five competing offers this fall. This 2 1/2-storey structure was erected on a 20-by-93-foot lot about a century ago, but the mechanics and living and dining rooms were all modernized by a previous owner. The seller renovated all three bathrooms and the second-floor master bedroom as well as the eat-in kitchen, where stainless-steel appliances, tile backsplashes, a marble floor and Cesarstone-topped peninsula were installed. A rear entrance off the kitchen gives access to a new two-tiered deck and stone patio. The lower level consists of a recreation room, while the upper floors are sectioned off for four bedrooms. 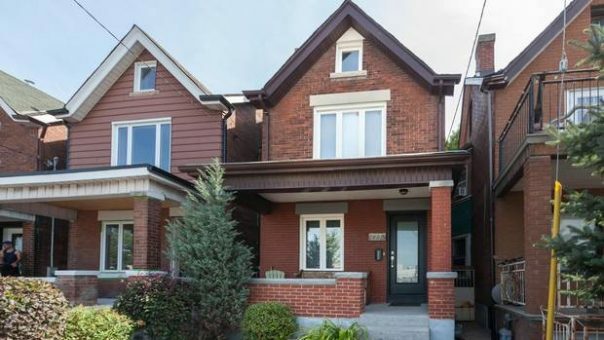 “It was really well priced because it’s on a busier street, but comparable houses were not detached – usually they were semi-detached – and not as renovated,” says agent Julie Kinnear, who notes the street is destined to improve once work progresses on the TTC yard. It’s going to be residential, commercial, low-income and private; it’s going to be great. I think it’s going to add value and density, which means better shopping, restaurants and amenities. This house’s value has increased with modern touches, from a wood-lined alcove in the master to exterior trellises lined with foliage. “What [the sellers] did was contemporized it. It had a suburban feel before and this time it’s very downtown, very cool, very white and bright with splashes of green,” Ms. Kinnear explains.